The new commercial attraction at the storied Apollo — itself newly surrounded by hundreds of fresh apartments and condominiums — will be "Djembe! The Show." Although the show is coming here from Europe, it's billed as a celebration of "Mother Africa," not just a history of music but a history of humanity to boot. The Broadway Playhouse has a new show celebrating female friendship in the 1950s and 1960s. And after a long spell outside of the spotlight, the Apollo Theater in Lincoln Park is coming back to life. Finally, some life in the dormant commercial sector of long-running shows in Chicago. The new commercial attraction at the storied Apollo — itself newly surrounded by hundreds of fresh apartments and condominiums — will be “Djembe! The Show.” Although the show is coming here from Europe, it’s billed as a celebration of “Mother Africa,” not just a history of music but a history of humanity to boot. In essence, “Djembe” (the title comes from the rope-tuned, skin-covered goblet drum of that name and is pronounced JEM-bay) features drumming and musical performances by a cast composed mostly of West African musicians. 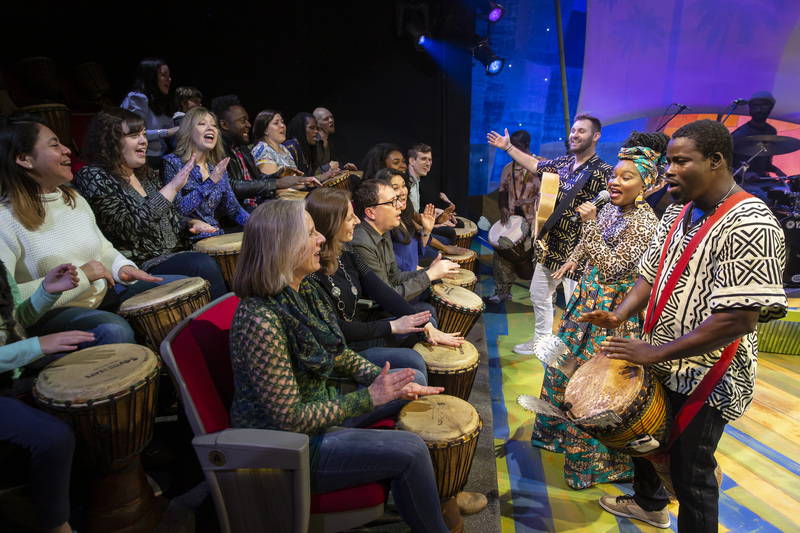 Although this is a for-profit endeavor, “Djembe” is a different kind of sit-down show — one more in tune with what audiences value these days. There is a philanthropic element: Merchandise from a village in Senegal will be sold in the lobby. And there is an interactive element: You will be handed a djembe and invited to play along. The music in the piece is partly composed of traditional West African beats and partly of djembe-infused takes on the playlist of Western artists like Beyonce, Michael Jackson and Pharrell Williams. “Djembe,” which was created by Doug Manuel and the Cirque du Soleil alum West Hyler, is not a new show. Under its old title, “Do You Speak Djembe?,” the piece has toured throughout Europe (especially in France and Switzerland) and also shown up at various corporate events in the United States — an Oprah event, a TED talk, savvy stuff like that. But the Chicago run of a show that has gone through some subsequent development is being billed as the United States premiere (“Djembe” has not yet been seen in New York). It never has been seen in a U.S. theater before.